What do you have planned for your sweetheart today? Will you be walking in the door with a dozen red roses in one hand and a box of chocolates in the other? Or perhaps that special piece of jewellery you had made will be tucked into your pocket to surprise her with later this evening while you are dining at her favourite restaurant? Or maybe you are like the rest of the regular Joes out there that are in between diapers and hockey practice, with date night regulated to once every six months, if you can swing a babysitter. Well family man, no need to let the day go by without any kind of recognition. You know I always have a suggestion or two for places to go in London, Ontario that are sure to please. You could win brownie points with the whole family by taking them skating at Storybook Gardens this evening! Not only do you get some fresh air and exercise, but there will be free hot chocolate, compliments of Libro Financial Group. The best part is that it is only $2 between 6-8 pm! Don’t fret if you don’t have skates, as Storybook rents them too. Perhaps it will even get you all in the spirit for the upcoming 2013 ISU World Figure Skating Championships that will be held right here starting March 11th, 2013. If skating is not your thing, what about putting someone else to work to ramp up the charm on Valentine’s Day? I bet your sweetie has never received a singing Valentine before. This year, why not get the London Sweet Adelines to croon to your baby? Now that will set her heart on fire! For $35, a portion of which will be donated to the Heart & Stroke Foundation, a local quartet will come to your location of choice and sweep your sweet someone off their feet between 9 am – 8 pm. Call Judith now (519-472-2164) and watch your loved one swoon later. Perhaps you were dreaming of something bigger to surprise your sweetie with though. How about a night out at Museum London for their Domestic Disclosures: A Valentine’s Night of Trailers! The evening begins at 7 pm and you will be treated to trailers from some of the fabulous upcoming movies that will be shown at the Domestic Arrivals Festival starting February 28th, 2013. While you can enjoy sneak peaks to movies, there will also be specialty coffees and sweets from local chocolatiers and gourmet food artisans to indulge in afterwards. Plus you get a chance to pick up tickets to the upcoming festival there and then, ahead of the rush for the 4-day festival celebrating Canadian film. Oh, and did I mention that tonight’s events are free? Although Museum London always welcomes donations and will have great door prizes to bid on, if you so desire. Sounds like an evening that can’t be beat! Whatever you get up to, I wish you a happy day and steamy night! Happy Valentine’s Day! And romance screeches to a halt! Now that is no way to create a warm and inviting bedroom retreat for lovers, or anyone else for that matter. If you want love to sizzle in the bedroom, then perhaps you should put a little effort into its appearance before stepping in the door. 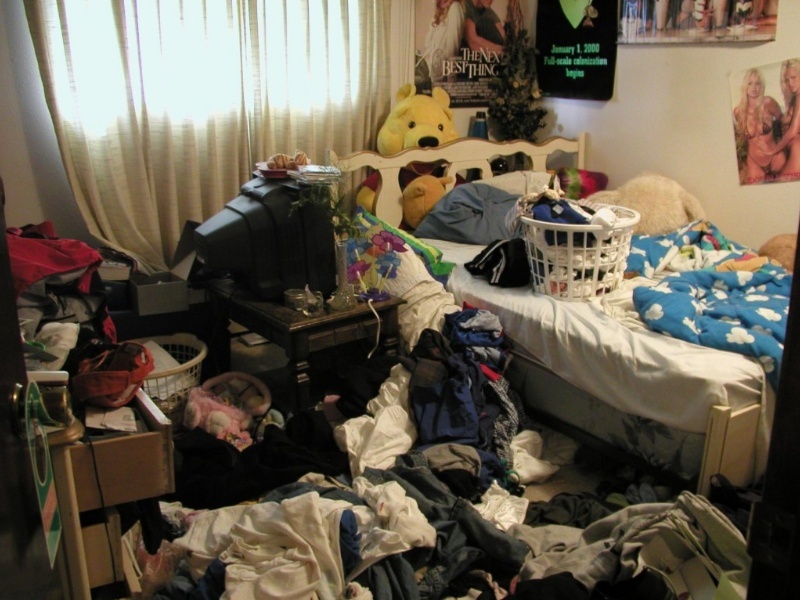 If you want to invite someone into your bedroom this Valentine’s Day, why not start with a little decluttering first. You wouldn’t show your house to strangers all cluttered with old magazines, dirty piles of laundry or mystery unmentionables, so why expect that a lover or even YOU should want to escape into a bedroom that has forgotten what its floor is made of. Toss the garbage. Put away the laundry and organize those unmentionables. Decluttering is always the first step in making any space inviting and your bedroom is no different. Turn the lights down low for that romantic feel. You can do that by installing a dimmer switch to create an ambience that oozes passion. Lighting candles always ups the romance factor, but so too would a chandelier over the bed. Don’t forget about the harsh light of morning after a late night of loving. Investing in blackout curtains could mean a few more minutes or hours of cuddling the next morning. When we think of passion, it is always hot, hot, hot, but not if the floor feels like ice! Short of ripping up the flooring to install ambient heat, there are other ways to keep the warmth alive in your bedroom. A thick underpad underneath a deep carpet adds a touch of luxury that anyone can appreciate. If carpeting isn’t in the budget, then look at what an area rug can do for you. You would be amazed at the perks of a posh rug on your aching toes and how that just might make the rest of you come alive too! While you can appreciate a luxurious floor, what do your walls add to your bedroom? Your bedroom is your retreat and you should colour it like that. If you are looking for passion between the sheets, red on the walls might just add some oomph to your love life. If you want a calming retreat to escape to for some much-needed sleep though, then perhaps calming blues, greens or lavender will suit you better. A bolder coloured accent wall can serve as the perfect place for your headboard. A lighter shade from the walls on the ceiling can create a cozier niche to rest your head. Most importantly though, a fresh coat of paint will make you feel more like stepping into your bedroom retreat at the end of the day. If you have made it in the door, adjusted your lighting for love and are ready to slip between the sheets, Stop! What shape are your sheets in? If you want to feel like a king or queen, your bedding can be an important step. Thread-count might mean little to you on the packaging, but when you slide between the sheet, you will feel the difference that decent linens make. The higher the thread count, the denser and softer the sheets feel. They also last that much longer, so do yourself a favour and invest in yourself and your sleep. A few extra pillows, a warm duvet, plus silk, flannel or down can make all the difference when creating that inviting haven in your bedroom. You are worth it! And now the rest is up to you. Here’s hoping that your bedroom heats up this Valentine’s Day! The roads are dry. Since the groundhogs predicted spring is on the way, there hasn’t been a flake of snow in the air. And as a consequence, the leathers have been broken out by a few of the hardier bikers out there already. This weekend you just might see a whole slew more of them though, as the annual World of Motorcycles Expo revs into London, Ontario. The Agriplex at the Western Fair District will have motorcycle enthusiasts out in droves starting at 4pm on Friday, February 10th. Show hours are 4-10pm on Friday, 9am-6pm on Saturday and 10am-5pm on Sunday, with children under 12 getting in free and $15 for general admission. In light of the recent news regarding the Electro-Motive situation, Womex has decided to lend their support to the cause by their announcement that all EMD employees can get into the show for half-price($8)! If you spend more time in your minivan then on your motorcycles, I have a suggestion of how you can change that, at least for 90 minutes on Saturdays. A local woman by the name of Maria Calleja is the owner and driving force behind Budding Artists and she is at the London Farmer’s Market every Saturday putting on children’s art workshops featuring master artists. If you want to take in the chrome over at the Agriplex, but don’t want to worry about junior knocking over a bike stand, then drop them off for some art history, games, stories, an opportunity to create their own masterpiece, plus lots of fun, as they learn about Amedeo Modigliani. The workshops are 90 minutes and are held at both 10am and 1pm, for the low price of $20 (includes cost of materials). Call her today to register for this workshop or any of the upcoming Master Series workshops. And as an added bonus, if you bring in any “heart” art that your children create, she will donate $3 to Project Love’s annual global literacy drive. You know what stats say that people want most for Valentine’s Day though – Time. So if you would rather spend time with your loved ones this weekend letting them know how much you care about them, why not settle in for some fun activities at home. You can work on your “heart” art to ship to Budding Artists, play a few games or maybe even whip up a batch of Valentine’s inspired cupcakes! If that last idea sounds like a winner, than check out this yummy recipe I found! Preheat oven to 350 degrees F (175 degrees C) and line 12 muffin tins with paper cupcake liners. In a large bowl sift together the flour, baking powder, salt, and cocoa powder. In the bowl of your electric mixer, or with a hand mixer, beat the butter until soft (about 1-2 minutes). Add the sugar and beat until light and fluffy (about 2-3 minutes). Add the egg and beat until incorporated. Scrape down the sides of the bowl. Add the vanilla extract and beat until combined. In a measuring cup whisk the buttermilk with the red food coloring. With the mixer on low-speed, alternately add the flour mixture and buttermilk to the butter mixture, in three additions, beginning and ending with the flour. Working quickly, divide the batter evenly among the 12 muffin cups and smooth the tops with an offset spatula or the back of a spoon. Bake in the preheated oven for approximately 18 – 23 minutes, or until a toothpick inserted in the center of the cupcakes comes out clean. Cool the cakes in their pans on a wire rack for 10 minutes and them remove from pan. Let cool completely before frosting. Either spread the frosting with a knife or offset spatula, or use a large 1M Wilton open star decorating tip to pipe the frosting. Cream Cheese Frosting: In the bowl of your electric mixer, or with a hand mixer, beat the cream cheese until smooth. Add the vanilla and confectioners sugar and beat until smooth. Using the whisk attachment, gradually add the heavy cream and whip until the frosting is thick enough to pipe. Add more sugar or cream as needed to get the right consistency. **For those of you who might need a little more instruction (like ME) with this recipe, here is a handy how-to video from the good folks at the Joy of Baking (where I found this recipe) for your help.